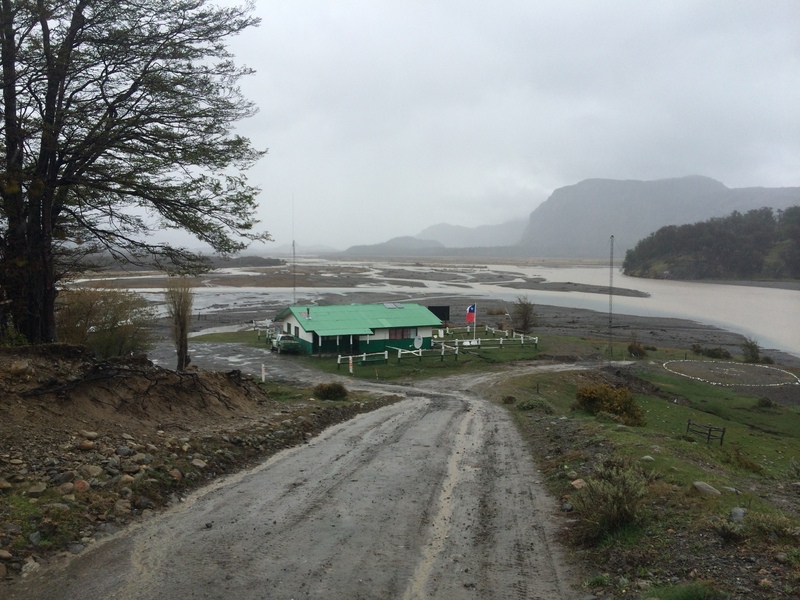 I’m have made it safely to Tres Lagos, a colorful town in the middle of nowhere in Argentinian Patagonia. 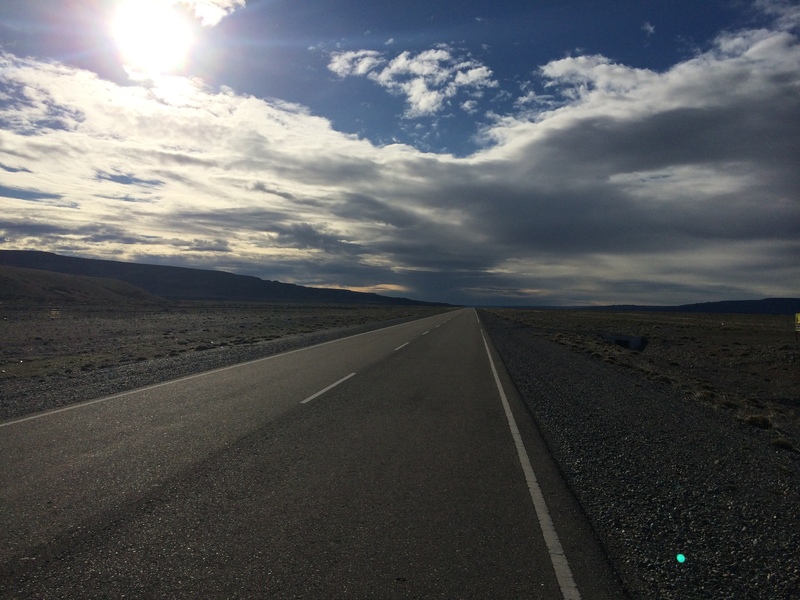 I survived the border crossing at Mayer, and about 350km out of the 388km of Argentinian road that I could have traveled so far. Bear with me, because this is going to be a bear of a post. Let’s start with me searching for information about the entry. Not a good start. After explaining that it was my only way into Argentina in this season, he said he understood, and that although possible, the pass would be very difficult with a loaded bike. The only saving grace, he said, was that the Carrera River (one of the larger rivers I would need to cross) may be low enough that I could just cross it on foot rather than searching for the tiny bridge (basically a sheep bridge) further upstream. He said that he couldn’t really guide me further, and that I should go talk to the border and talk to the police officers there to get more detailed information about which path (this whole “right path” thing sounds hilarious to me in retrospect…) to take. I thanked him, and went on my way. 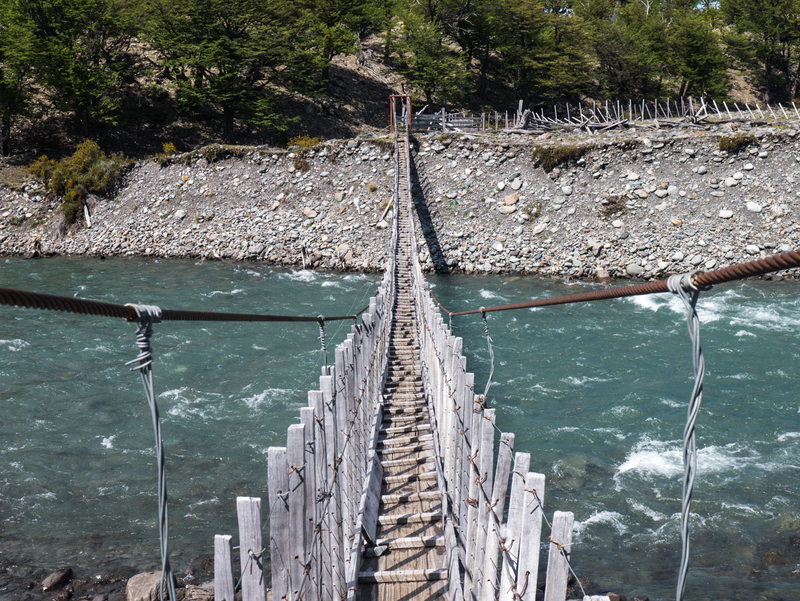 An old and new bridge over the Mayer River. Not THE bridge, as you’ll see later, but A bridge. 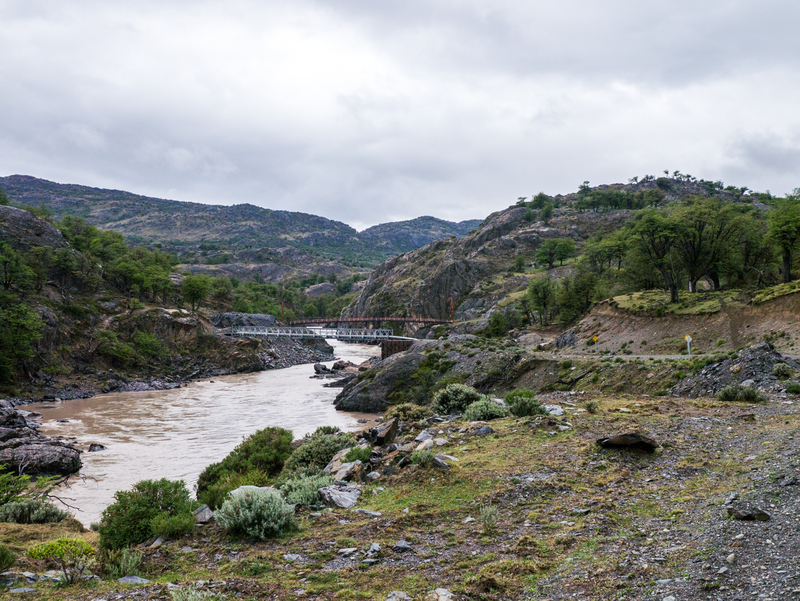 Then I met a British family who had been traveling the Carretera in their 4×4 who said they had met a French cyclist on their way who heard bad things about Mayer and had taken the pass at Roballo before Cochrane. Then it started raining. And raining. And raining. Oh how it rained for two days before I went for the crossing. Exit station. Road ends here. And off I went. Into the wild. Alone, with a heavy bike, and a rough map to guide me to the bridge. Oh, and irrational levels of confidence in myself and a whole ton of thirst for adventure. What followed was an eight hour ordeal (and that was the first day), involving five glacier-fed river crossings all with my bike on my back, fields that should have been such but had been turned into bogs by the rain, plateaus climbed and fallen down, minefields of logs to heave my bike over, lost paths, “found” paths, soggy roads, and and a mismarked map that had me going along a muddy mess of a road in the (and I know I use this term a lot) middle of nowhere hoping that I hadn’t suddenly accidentally missed the entrance post and illegally entered Argentina. Hardly a road. Soggy. Muddy. Messy. Paths everywhere. Some leading somewhere, others leading elsewhere. Who really knows? I didn’t follow many paths, because so many just stopped in the middle of a field or at the edge of a swamp. Couldn’t ride them because they were so swampy. 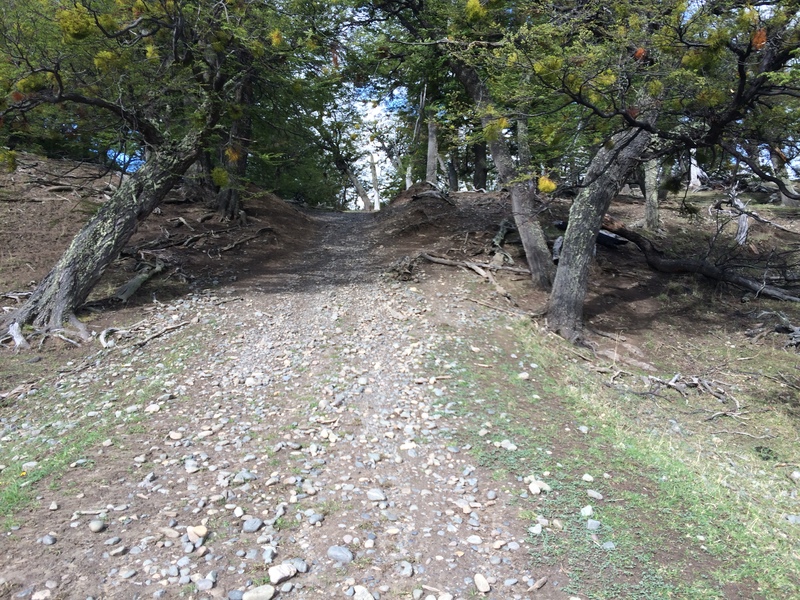 Pick your poison: Go through flat, swampy as hell land or up and down along the path on the hillside with dozens of huge downed trees to lift the bike over. This picture makes my shoulders hurt. I managed to find the bridge, which was about halfway to where I thought the entrance post was. 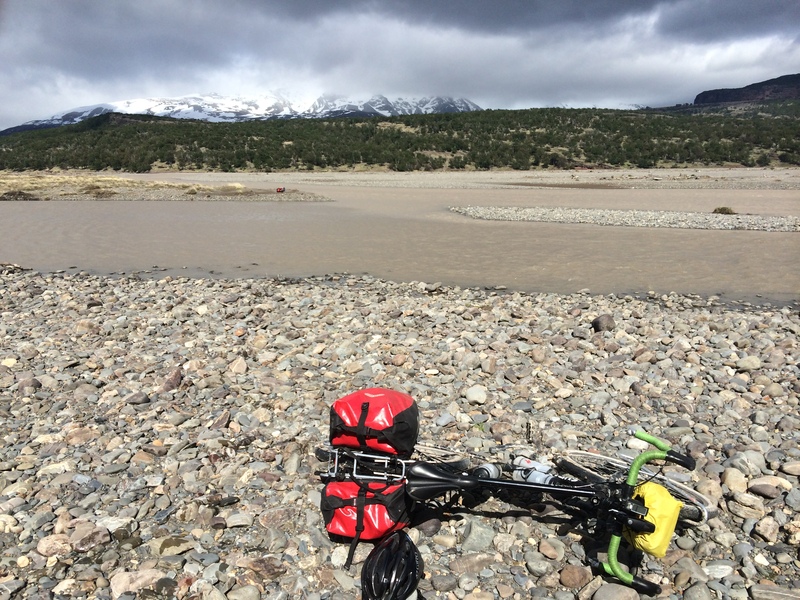 It was a really cool Indiana-Jones-esque bridge, swaying in the wind over the river which I clearly couldn’t have forded without, but I had to cross it 6 times in order to cart all of my gear piece by piece. Gradually, my shouted obscenities moved from wonder (wow! what a place!) to anger (ugh! what a place!) to frustration (why does this place exist?) and finally to just utter exhausted misery and exasperation (Why is this place on the map not that place in real life?) Below are a few pictures, but after a few hours I just didn’t feel much like getting out my camera. I was just beat. 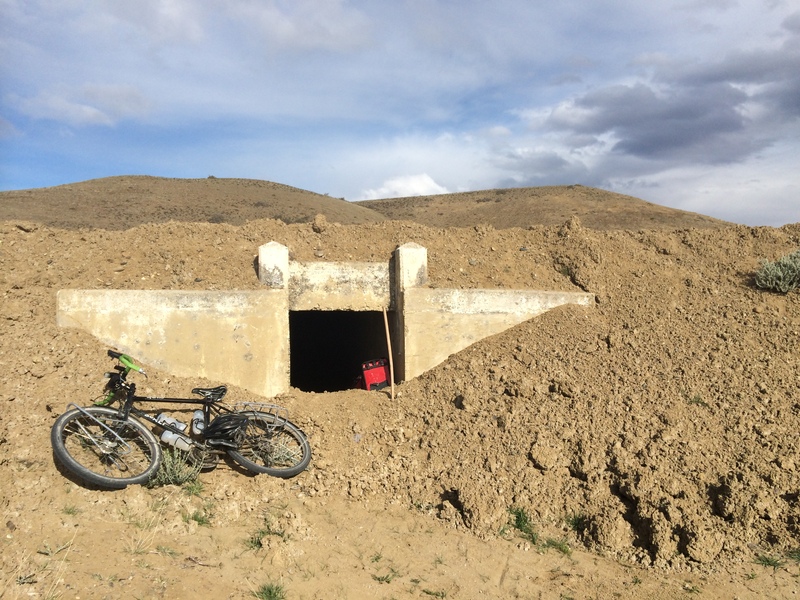 Finally, after hours and hours and with the sun falling lower and lower in the sky, I stumbled over some nasty roads and a few more creeks (which I just crashed angrily through with my bike fully loaded) and found the entrance station. THE bridge. 1.5 feet wide, could only take one bag at a time in order to hold the railing, since damn did that water look cold. Like a path to heaven, this road suddenly appeared at the end of the day. The start of Argentinian Route 81, and the road to the entrance point. Very surprised to see me stumble out of the wilderness, the guys at the entrance point checked me in and pointed me to a place to put up my tent. BUT WE’RE NOT DONE. I left the next morning, thinking that the border point would basically mark the start of a good, ripioed road. BUT NO! My shoes were nice and warm and I was actually wearing socks when I came upon the final ford. 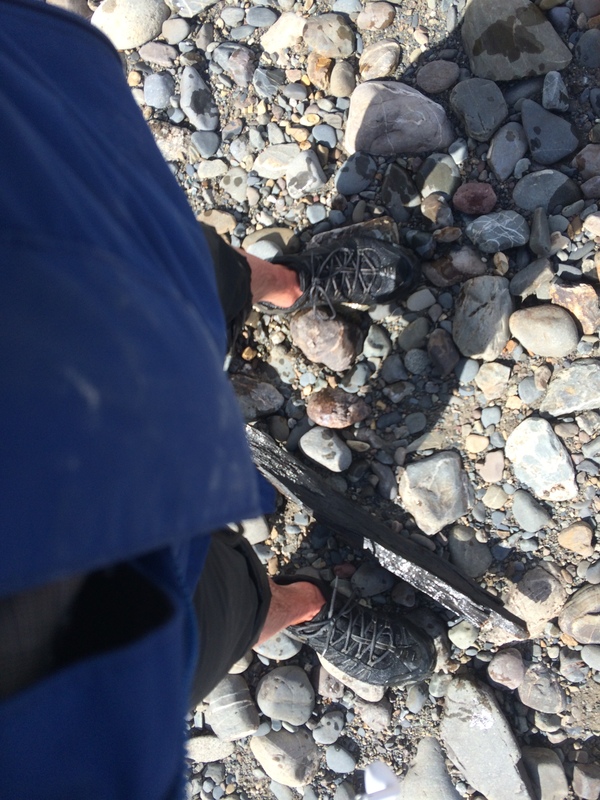 7km past the entrance was a river with brown glacial water up to my thighs, and I had no choice but to cross. So, three back and forth crossings. Two with bags, and one with bike slung over my shoulder. Somehow, I knew that this would be the last one, as I could see the road go up a plateau in the distance. But that didn’t make this one final crossing, at 10am early last week, an absolutely hellish 30-45 minutes after the day I’d already spent in Mayer. When I was done, I collapsed on the sandy bank, utterly spent. But with the road beckoning, I decided to press on. Each kilometer brought a better and flatter road, with more and more solid tracks and less mud. 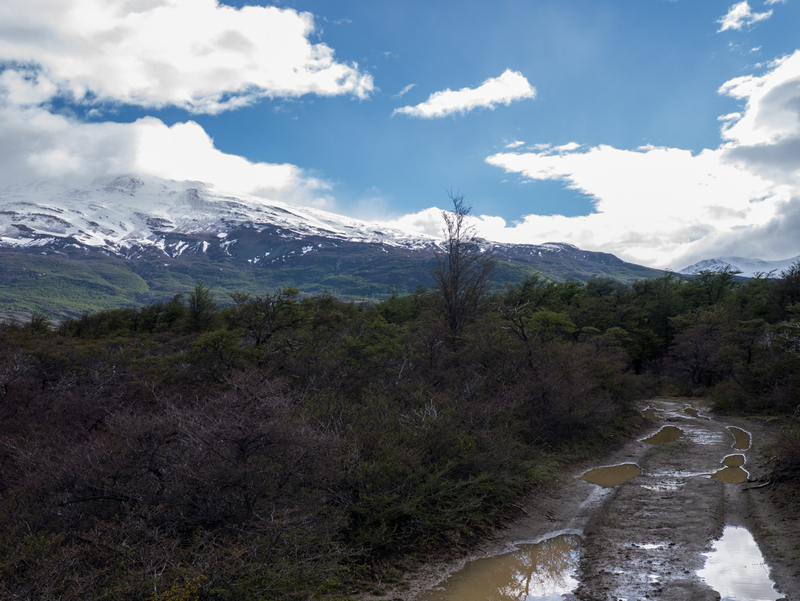 Through a final valley, past one more snowcapped plateau, and suddenly the Andes were done. 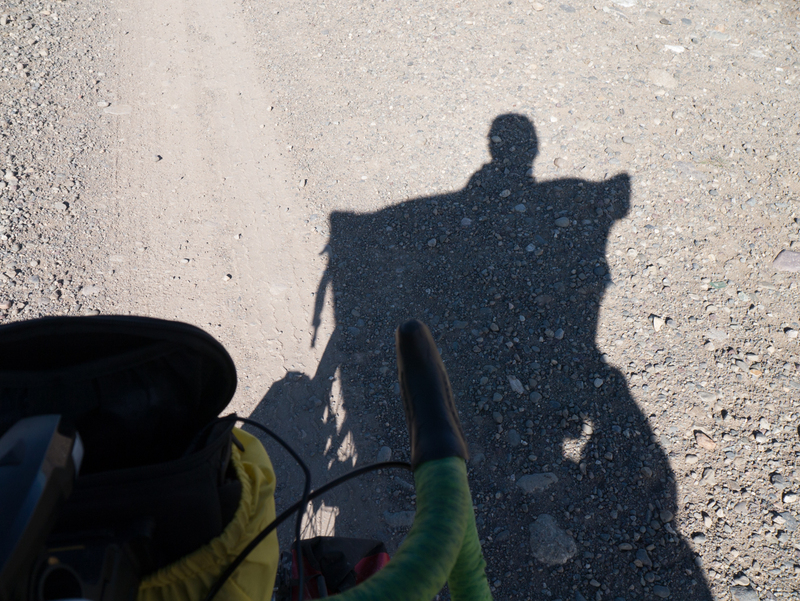 I crested one more hill, and Argentina stretched out before me as far as I could see. I was through. Fist pump. Move from point A (bike) to point B (far shore). …and suddenly the Andes just disappear. I left a piece of myself in Mayer. If someone finds it on some future trip, I’m sorry. It’s not a very nice piece of me. 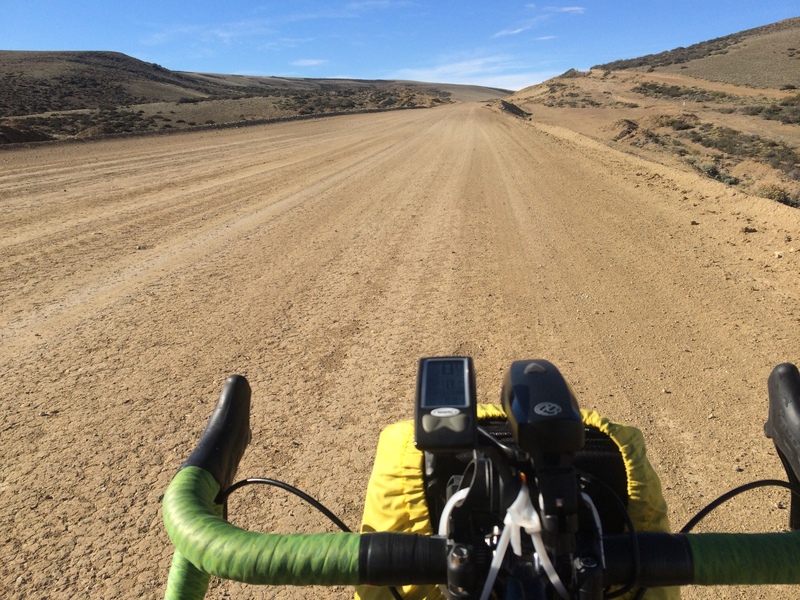 After Mayer, the road flattens, and there is almost always a fantastic tailwind. This led to one of the best innovations of the trip. I grabbed a fence post, put both ends into the pockets of my jacket, and created a sail. I could hardly stay stationary with the sail up, which made the 80km I did after the final river crossing a breeze. Almost like a very slow motorcycle trip. I have another selfie of the setup, but I prefer this one that makes me look like a flying squirrel. 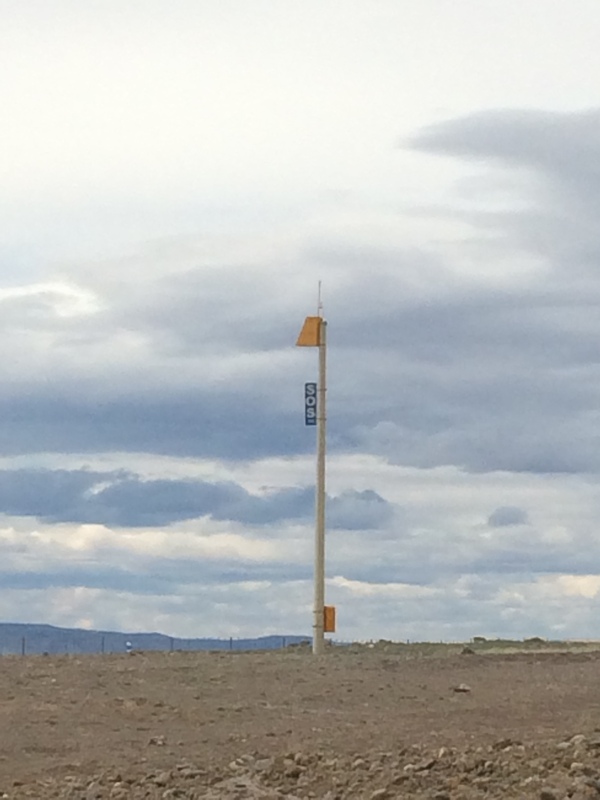 Since a little ways after Coyhaique, over 800km ago, I’ve been on ripio. 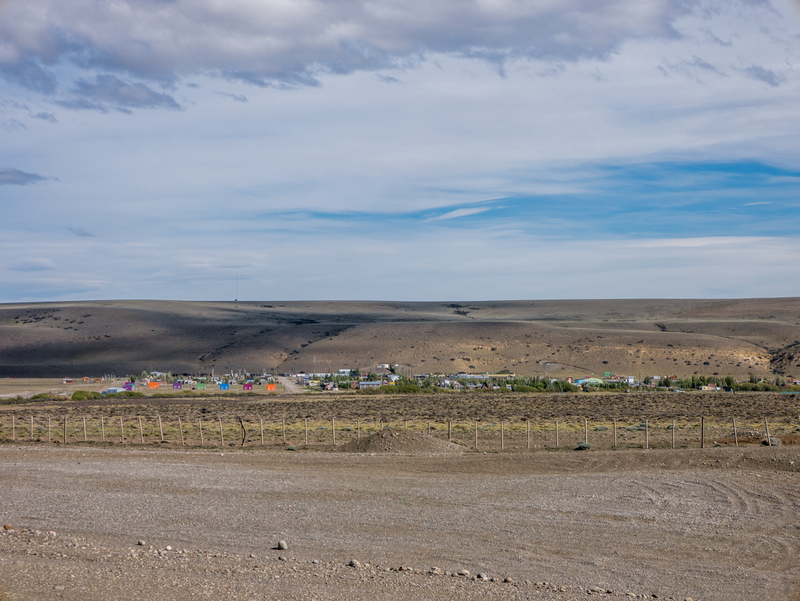 Part of the reason I put in so much distance on this day was that the ripio comes to an end when the road from the border ends at the famous Ruta 40. 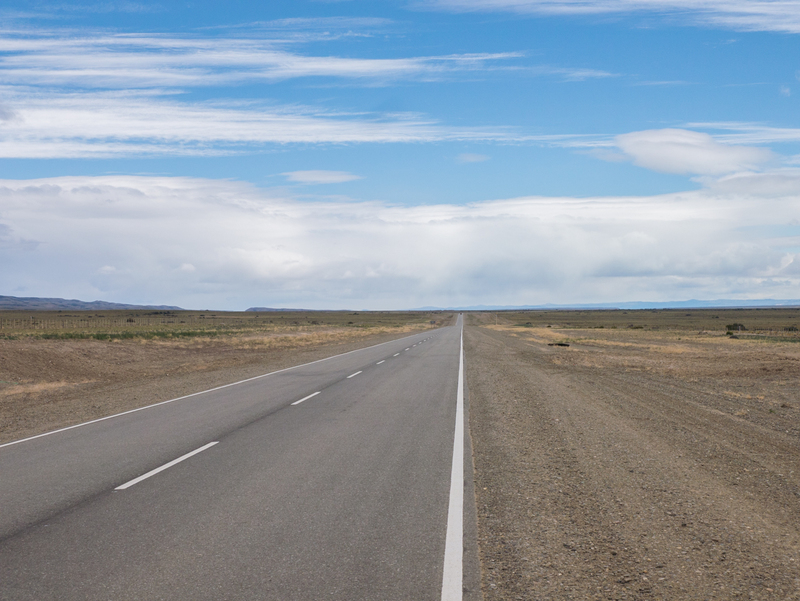 Ruta 40 stretches from the top of Argentina to the bottom, and it is ALMOST all paved. As the sun set behind me over the Andes at the end of my two day ordeal crossing the border, I sailed over the plains and was rewarded with the ultimate prize. I could barely contain my excitement when I finally hit it. The ripio, for all intents and purposes, was behind me. 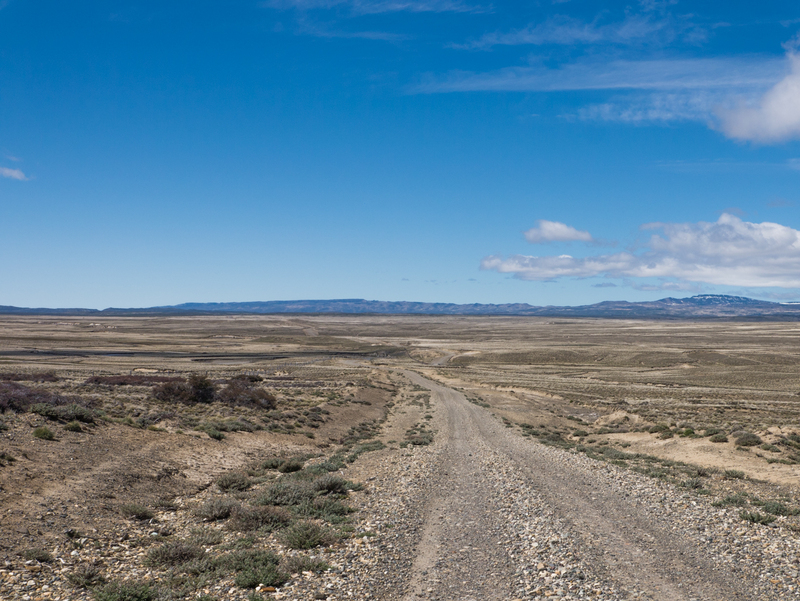 Ruta 40, in all of its wonderful flatness and straightness, stretched into the distance. This morning after a night with some Bolivian workers in a deserted resort along Ruta 40, I reconstructed my sail and set off once more. For weeks, I had been looking forward to this particular 75km stretch of Ruta 40, as it is straight as an arrow and at a 0.2% downgrade for the entirety. After days of averaging, on a very good day, 15-17km/hr ignoring rests, I averaged 40km/hr for this section with a strong wind in my sail. 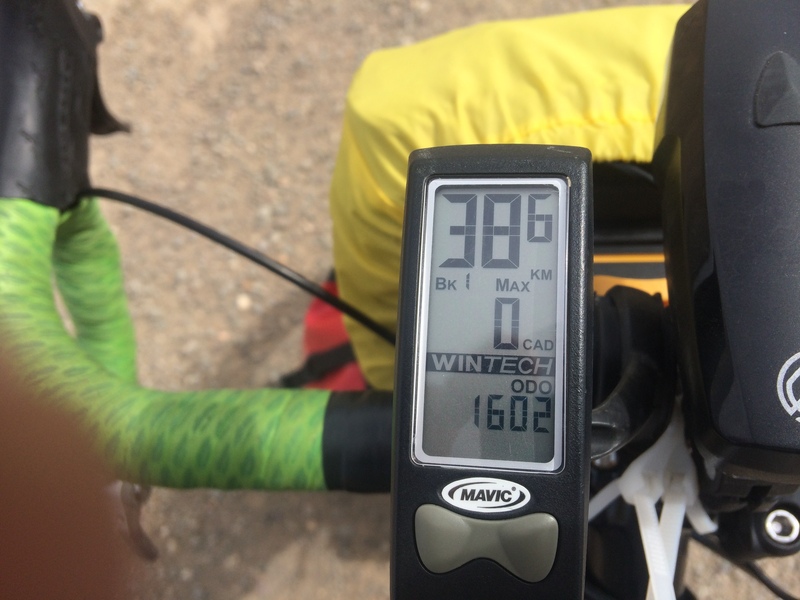 I was at 80km by lunchtime, and hit Gobernador Gregores at 125km in just about four hours of riding. It was awesome. Led Zeppelin pretty much the whole way, and maybe 3 cars total. Fist pump. pancakes. Enough slope to keep the butter in place just long enough to convince you that you’re safe from it running off while you get the jam.” Creating that metaphor kept my mind occupied for hours. Enjoy it. Ominous. Not a clear shot because of the wind. Right in my face here. Yup. Someone else took refuge in this drainage ditch at some point. But then things, as things tend to do, changed. Look at a map, and you’ll see that to continue on Ruta 40 out of Gobernador Gregores, the road basically does a U-turn. My first and second days out of Gregores, my wonderful 40km/hr turned to 10-12 when I could ride, and 5 and many skidouts when the wind came from the side, making it difficult to ride in a straight line. 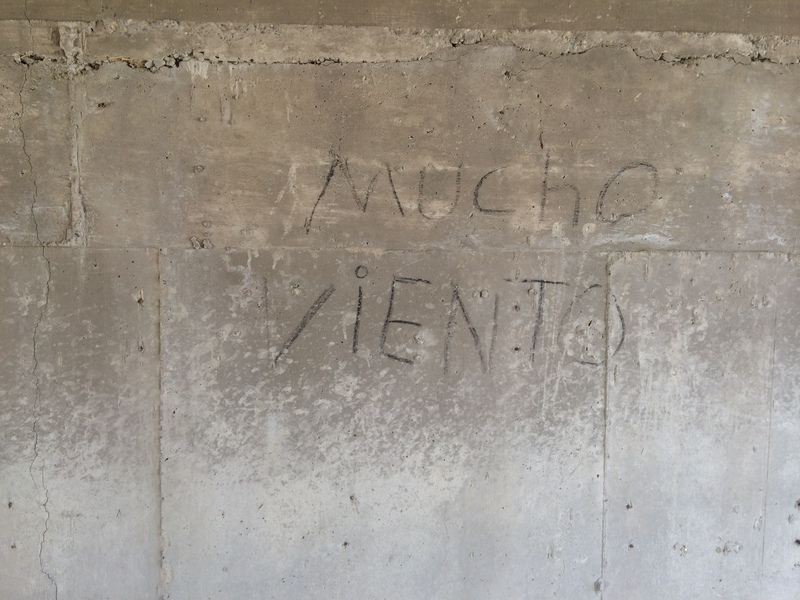 Two days of windswept, barren hell, that turned even worse when the I hit nasty gravel and a line of dumptrucks doing construction on one of the final unpaved stretches of Ruta 40 between Lago Cardiel and Tres Lagos. The wind, typically stronger in the afternoons, got so strong for awhile that I hitched a ride with an Estancia worker for about 20km when I saw a long, straight stretch ahead of me with nothing but headwind. 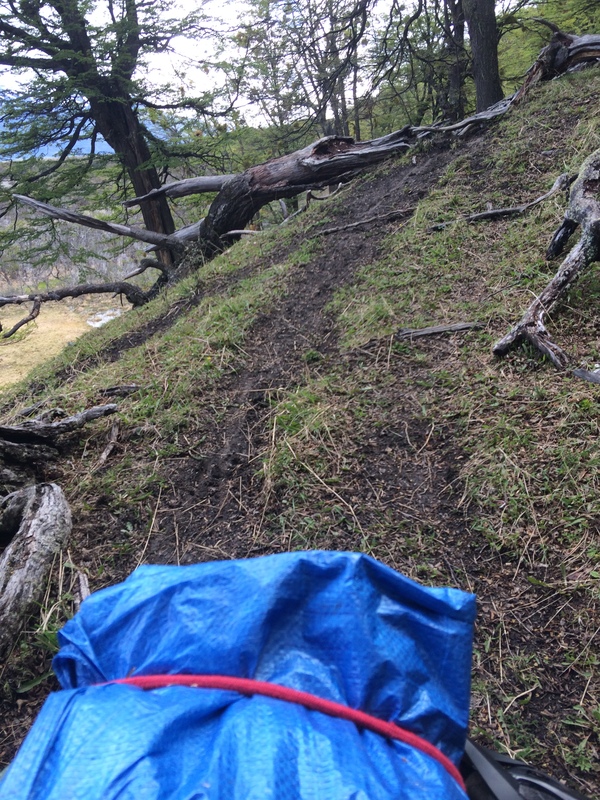 With absolutely no ground cover ever, I huddled and eventually camped for a night in a particularly comfy drainage ditch, which provided some respite from the sheer brutality of the wind. 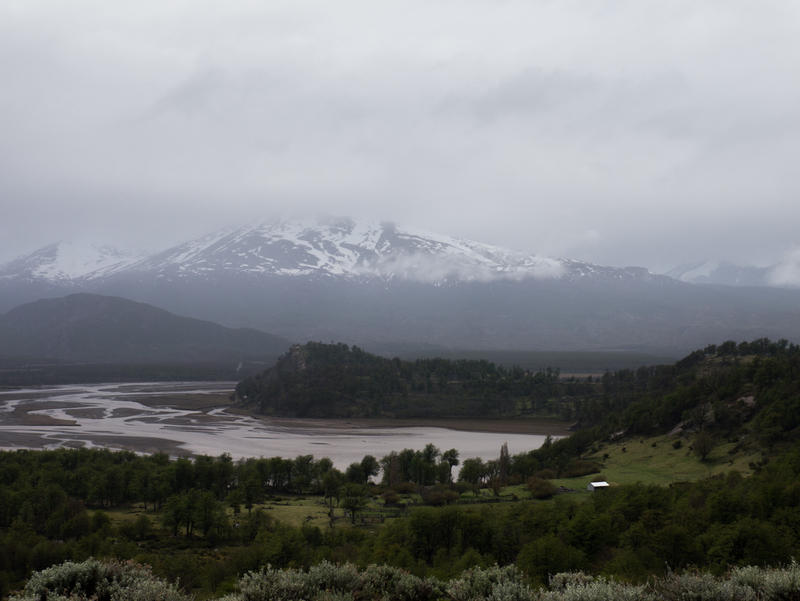 I don’t have many pictures of Argentina to this point, because there’s just not much to see. Just road, more road and endless Martian landscapes. Also, limited water, hence the rush to get this section done. 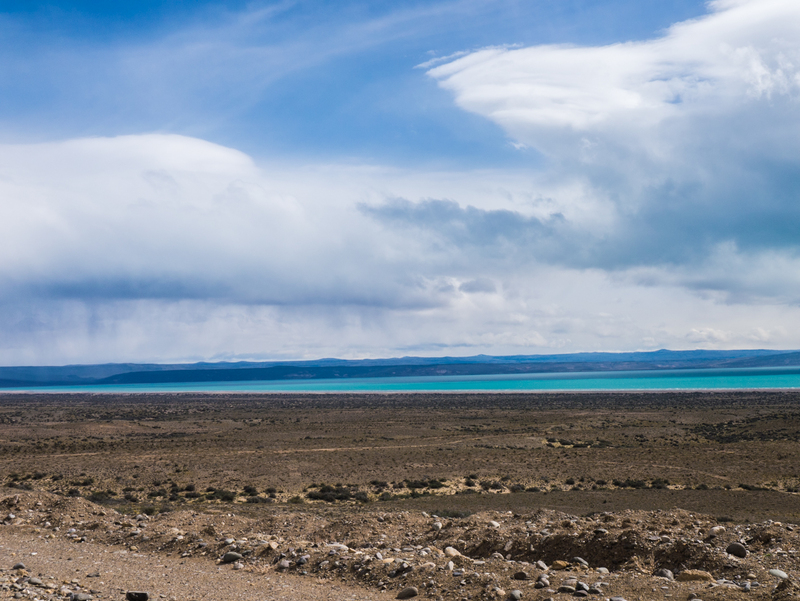 After I get to El Calafate, there are many more roads traveling southwest, which will make the going much, much easier. But for now, this wind is making me crazy. It’ll do for a night. I’m not Saddam Hussein, so I like windows in my spider holes. At least the gravel on Route 40 is nice and, for the most part, packed. Anything new? Nope. Just road. Nasty headwinds here. Oh hey! Something to see! Lago Cardiel. I thought they were going to get away with not naming it Lago Verde like everything else down here, but the guy who gave me a ride was on his way to… the Lago Verde Fishing Lodge. Come on, now. On a more positive note, I came around a bend one day and found the French cyclist that I’d been hearing about for a month who crossed at Roballos! Little did I know, we’d been sort of circling one another for awhile, and at the resort with the Bolivians we’d only missed each other by a few hours. He’d been hearing about me for a few weeks from people on the Carretera, and I’d heard about him from a few people who passed us both in cars. Then suddenly, there we were. Very “Dr. Livingstone, I presume?” We’re almost the only cyclists down here at the moment, and word gets around. We just happened to be going opposite ways one day, a result of him taking a different road and then turning east to the Atlantic and me going west into the damn wind. We shared stories for about an hour, and then went our separate ways. Both going to Ushuaia, I hope we meet up again at some point. We share a dream of showing up in Ushuaia and finding some boat to take us to Chile’s Antarctic settlement as a final goal. Nice guy, who’s been traveling the world for a year and a half. Tres Lagos appears to the side of the road. So there you have it. 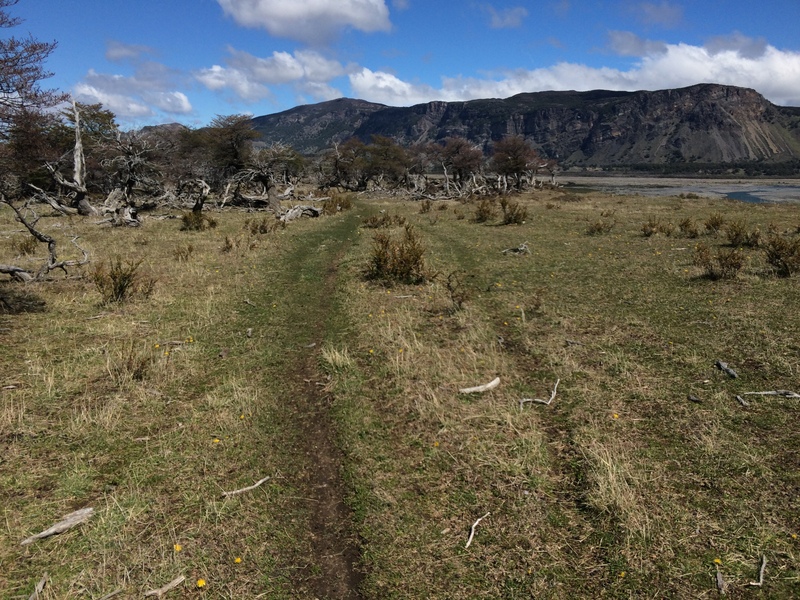 The most intense section of the trip lived up to every word that I had heard about it, and Argentinian Patagonia has alternated between ridiculously tough and simple based entirely on my direction of travel. It all adds up to my best feeling of accomplishment yet, which is absolutely intoxicating. 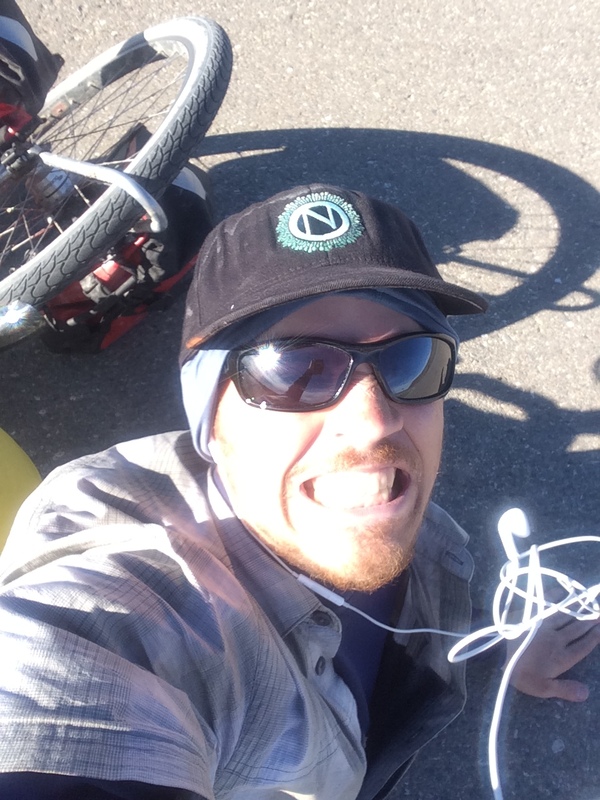 As I tell people I meet along the road, I may struggle and curse and yell for an entire day, but in the end, when I’m sitting in my tent or in a hotel room, I’ll start of every journal entry with something like “well, it was a tough day, but a lot of fun!” I just love it out here, despite all the difficulties. I’m starting to have these dreams that mix life on the road and life outside of the road. Sometimes I’ll be on tour in the dream, yet tying myself into knots over how to turn in an assignment or how to attend some class period. One night, I found myself in an Econ department meeting, but in my bike touring clothes and a week of sweat and dirt caked on my skin thinking “this just isn’t right.” But then I wake up, and I’m alone, sore as hell in a tent or drainage ditch dozens of kilometers from the nearest person, or in the workers quarters of some deserted resort or border at the end of the world. It is, in an odd sense, calming. There it is. 1000 miles. Almost. But I made it. I promise. Awesome post. 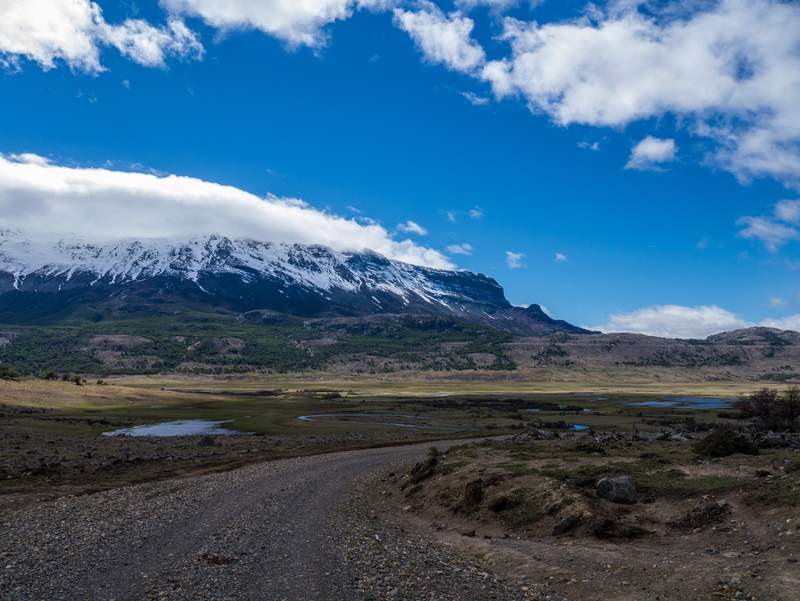 Gets me awful thirsty to be out on the road, and brings back some good memories of Patagonia. The many-paths-through-a-swamp-with nothing-but-a-bad-map thing is exactly how I got lost in Chiloé, so I’m glad you’re safe and sound. Save the gps log if you have one, I might be heading through that area in the opposite direction in a few years.